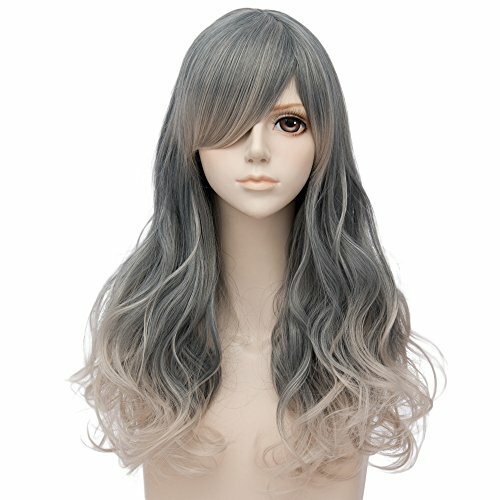 We WIMEPOM offer wigs with top quality materials, diverse styles and practical options.A comfortable and stylish wig gives you different feelings of yourself. Choose a hairstyle you like and choose a way of life you want.WIMEPOM is best choice for you. 1.High Quality Heat Resistant Synthetic Fiber,both natural looking and soft touch,you will be amazed by the quality. 2.You can wear the wig for daily use. You can also attend Halloween, party, cosplay, and any other occasions, it will make you more attractive and charming. 3.It's very easy to wear.Adjustment straps can be intertwined to a fixed position, and can be adjusted to different head sizes . 4.All Wimepom wig is well-designed.The natural layers, smooth hairline and exquisite curls altogether generate a vivid and fashionable looking wig. 2.Don't use hair pin for fear that it would damage the net. 3.Do not use hairdryers and other heat devices. Put the soaking wig in a dry towel and gently drain, but not wring. Soak a wig into warm water with shampoo for 10 minutes. Gently budge the wig without any rub. Rinse the wig in clean cool water to wash out the shampoo. Hold the wig far from open fire, hot water and air, sun light, heat devices. If you wear the wig daily, hold it on a special wig stand or model. If you wear the wig rarely, completely dry wig could be kept in paper box or package. Regularly ventilate the wig in open air (but not sun light). If you have any questions about this product by Wimepom, contact us by completing and submitting the form below. If you are looking for a specif part number, please include it with your message.